There are a wide variety of tents on the market that are suitable for families. Of course every family is different and has different needs when it comes to choosing the best tent for them. 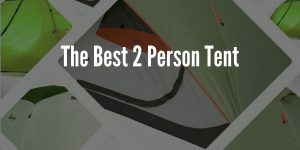 So I have considered some of the most important factors which will help you choose the best family tent for you. 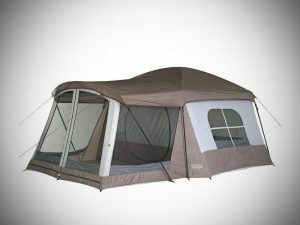 Not only is this Wenzel tent the best family cabin tent but I feel it is the best tent for family of 5. This tent is extremely spacious on the inside and you can comfortably stand up and move around even if you are tall like myself (6ft1). The setup on this tent is extremely easy it can be set up in about 15-20 minutes, though I would personally recommend it be done by 2 people, it makes it a little more convenient instead of doing it solo. This tent has a lot of windows and a mesh roof. Not only does this provide brilliant ventilation but it allows you to lie down in the tent and gaze at the stars or enjoy the clouds rolling by. Of course this mesh roof can need be covered with the rain fly with not only keeps the rain out perfectly well but helps keep the tent more insulated on the inside at those cooler times. Also one of the rooms can be used as a sun room, I personally like to use it as if where a porch because that’s exactly how it feels to me. There are windows on all sides of it so you can enjoy your surroundings all while being protected by those annoying bugs! 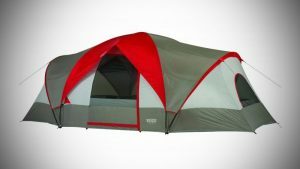 This Coleman tent is one of the top rated family tents for many great reasons, let me explain. The first thing I have to talk about with this tent is the insanely fast set up time. 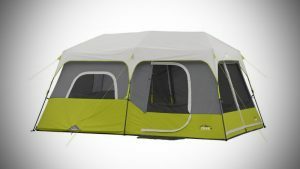 It can literally be set up in 1 minute, it’s sometimes hard to believe how Coleman have been able to design a tent that can be set up that fast, and take down time is just as quick. This tent is perfect for you if you don’t like the fussing and sometimes confusion of setting up this tent, because it is so easy and fast you will just love it. 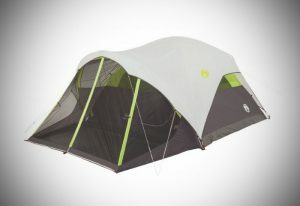 The second thing to mention about this tent is the ventilation that is provides. On 3 sides on the tent there are big windows, the one of the back is particularly big. There are also windows built into the actual door and finally some vents on top as well. This tent is ideal for warm and humid weather, the ventilation is so good, it’s rare to find a tent like this especially for such a price point. The waterproofing is brilliant. I have endured storms on this tent on handful on occasion and I am yet to see any moisture inside, it consistent and reliable in terms of the waterproofing, that’s probably why it’s one of the most popular tents on the market today. 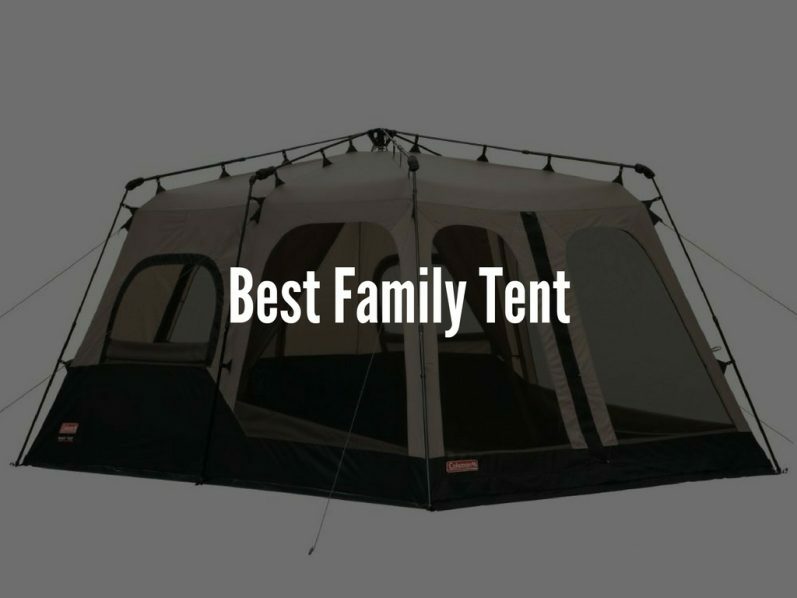 If you are a family of 4 this tent – best tent for family of 4. It provides additional space for comfort and for your gear also. If you are looking large tent for your family, this is the best large family tent available right now! Set up on this tent was a doddle, in only took me about 6-7 minutes to set this tent up from start to finish. One thing also worth mentioning is the take down on this tent is also very easy and getting in back into the included bag was easy which can’t be said for all tents, so this is appreciated a lot by me. This tent can be separated on the inside into 2 different rooms thanks to a divider curtain. This tent includes 4 mesh windows and vents in the roof of the tent, so ventilation is very good. This tent spaciousness inside is really top notch while it can hold 10 people, I would recommend it for a family of 4-7 with room for plenty of gear need be. Also this tent has a place in the top middle of the tent where you can hang a light and on the inside of the tent there is what Wenzel call a light reflection system with basically means when you hang a light the material is more reflection so it makes the light radiate through the tent better and this really helps with vision the darker it is. This is a particularly useful for when you have children at night time, it’s often overlooked so a big thumbs up from me on that one! 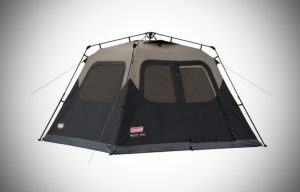 Cabin style tents are my personal favorite deign and this CORE tent is my best family cabin tent. 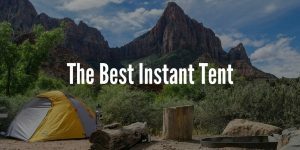 Let me start by saying this tents set up is so easy and fast, it can be set up in 1 minute, it’s a strong statement which is very much true, even if you are a beginner camper it should take you a maximum of 5 minutes. There is tons of space inside to move around you won’t ever find yourself bending over t move around, and there is room for 2 queen sized air mattresses inside. Another one of the things I love in the amount of light this tent can let in if you want it to. If you have the rainfly off and the windows open the tent lets in so much light it feels great. This also allows the ventilation to be brilliant as well. Everything is included in the package which is nice, it includes the rain fly, the stakes which have a great quality and finally the carrying bag which is solid. This is one of the best cabin tents out there. While this Coleman tent is great value for money it doesn’t hold back on the quality at all and you will be very impressed at what is has to offer for such great value. My favorite thing about this tent has to be the front porch area. This area really allows you to sit outside and really enjoy and appreciate your surroundings all while being protected from those pesky bugs. I really wish more tents had a porch area like this one, it’s an undervalued feature in my eyes. This tent has everything you would expect from a high quality tent, including a fast setup time of 10-15 minutes and waterproofing than can hold up to any bad storm in my experience. I would also like to mention that the portability of this tent is very good and it’s one of the easiest to carry and transport around with you, if you are a backpacker or hiker this could even be a solid option for you! Below I have listed 7 things I consider for all my family tent reviews and things that I feel are important for any family camping adventure! Of course choosing the right size of tent for you and your family is important and should not be overlooked. I always recommend going for a tent with is a bit more than you actually “need”. This is mainly because let’s say you are a family of 4 and go for a 4-person tent not only will it be cramped but there will not be room to keep things like gear and pets inside as well. So in this case I would recommend they go for a 6 person tent or an 8 person tent it they really want maximum comfort to enjoy their camping experience to the fullest extent. When you go camping with the family especially if you have children accessibility is important. What I mean by this is things like how the door functions and if there are 2 entrances that is a good advantage to have. These are important to consider. Same as any tent that you buy, it’s important to know that it can hold up well to the weather. All of the tents I have recommended below all have brilliant waterproofing. But things to look out for are materials used, for example polyester and canvas are some of the best materials when it comes to waterproofing and are always top of my list. Any tent that you buy should be a good investment that’s why it’s important to have cover if you do run into any problems. I tend to stick with tents that have at least a 1-year warranty this shows their manufacturer is willing to stand behind their product with a solid warranty. Of course pricing is important. I have included a range of tents for families of different wants and needs and I have highlighted the best aspects of each of the tents. 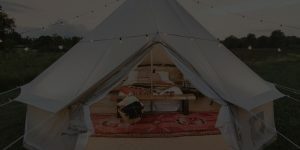 All of the tents I have mentioned below offer great value and that’s why they have made this list! I personally prefer tents that have a more upright structure, I feel they provide not only more space but are more comfortable inside and offer better ventilation. They are best suited to families because of that. 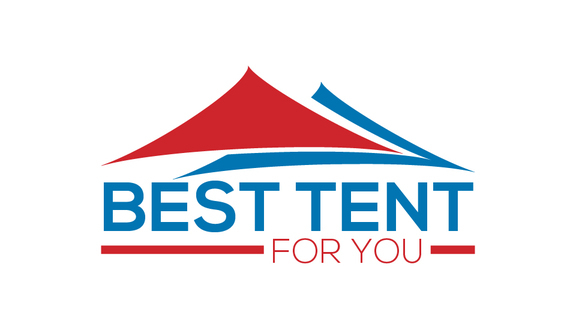 It’s important to choose the best tent for you to make your camping experience as special as can be! Take care and happy camping!